At the end of last week, the Svalbard Global Seed Vault made international headlines. A plethora of news outlets wrote about the water levels that had apparently invaded this “fail-safe” cache of the Earth’s seeds. 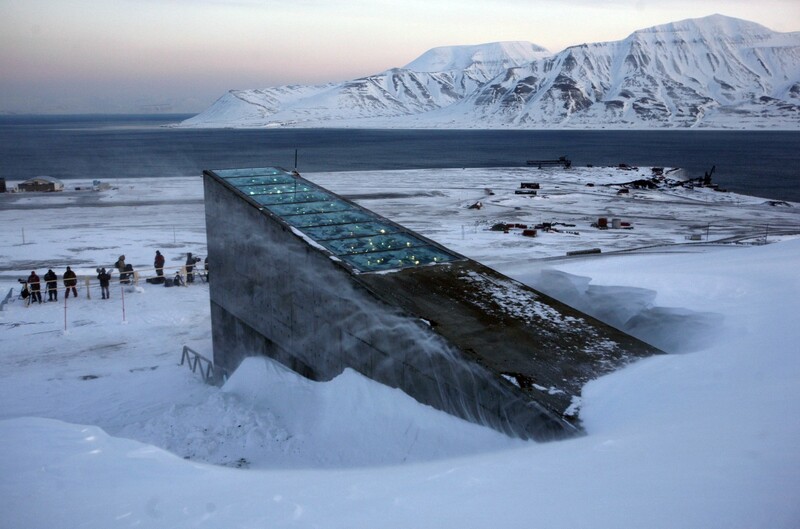 The seed vault’s purpose is to ensure the planet’s food supply, should a “doomsday” scenario take place. The vault is located in a deep location in an Arctic mountainside. The alleged failure to protect its insides has occurred after temperatures warmer than usual caused the melting of a layer of permafrost. According to The Guardian, this has sent “meltwater gushing into the entrance tunnel,” presumably endangering the world’s most varied selection of crop seeds. Alarming headlines – such as Wired’s “The Arctic Doomsday Seed Vault Flooded. Thanks, Global Warming” – have led people to ask about the real danger of the situation. However, days after the vault’s failure, reports stated the seeds were not damaged. Even though the water did surpass the vault’s threshold, the stash is currently safe. But that might not be the case for long. According to a spokesperson for Statsbygg—a non-governmental group that advises the Norwegian government, the owner of the vault—it’s only a matter of time before the trove of seeds gets infiltrated again. Satysbygg’s Hege Njaa Aschim explained that a lot of water entered the tunnel. Luckily, it froze to ice before touching any precious cargo. However, when the personnel went in, they said it felt like walking into a glacier. That’s saying something, considering the temperatures in the vault are usually below the freezing point. Despite the original alarming reports, Statsbygg retracted some of its statements on Saturday. A comment published on the seed vault’s website revealed that, yes, there had been “season-dependent intrusion of water” into the external part of the seed vault. However, the seeds had never been under serious threat from the melted ice. Moreover, the group has also reported the vault’s team was working on taking extra precautionary measures to make sure this situation does not repeat. Thanks to the proposed improvements to the outer tunnel, the seed stash will continue to stay dry and safe. According to the group’s statement, several upgrades are already underway. They include measures such as building deep drainage ditches on the mountainside to limit the meltwater accumulation around the tunnel’s entrance. The team will also remove heat sources – like a transformer station – from location. In addition, they will supervise the construction of waterproof walls inside the tunnel. Finally, Statsbygg hopes to stay on the safe side by keeping an eye out for the future development of permafrost on Svalbard. According to Crop Trust, an international nonprofit group that participated in the establishment of the Svalbard vault in 2008, “The seeds are safe and sound.” So what statement should we listen to? Should we worry about the water levels in the Arctic? Is this failure of a “fail-safe” vault no big deal? What will happen if a global catastrophe wipes away every green plant on Earth? Apparently, the answer calls off such a doomsday line of thinking. While representatives of Statsbygg and Crop Trust took their time to respond to interview requests, they eventually revealed their position. It seems the situation was not as dire as it initial reports made it out to be. “In my experience, there’s been water intrusion at the front of the tunnel every single year,” said Cary Fowler, an American agriculturist who helped design the seed vault. Though he did not observe the incident in person, he noted that news outlets should not be using the term “flooding” to describe the event. Fowler added that the blueprints did not require the tunnel entrance to be watertight. However, the permafrost melts in the summer, pushing some water into the tunnel. However, it freezes when it comes, which means it usually doesn’t get very far. In spite of the good news, Fowler thinks researchers should not ignore the fundamental cause for the melting permafrost. Increasingly warmer temperatures continue to pose a risk for the seed vault. Seeing that the entire planet is experiencing a warming trend, Svalbard naturally follows the trends. Global warming has been especially concerning in the Arctic regions, where the permafrost melts are just one of the many consequences. Another includes the drastic melting of major glaciers. In turn, this causes a dramatic rise of the sea level. There are currently almost 900,000 seed samples in the Svalbard vault. They range from sorghum and maize and from Asia and Africa to eggplant and barley and from South America and Europe. It is nowhere near to full capacity – the vault can provide storage for up to 4.5 million crop varieties (or almost 2.5 billion seeds). On the inside, the seeds stay safe and dry thanks to imposing concrete walls shelter and the constant minus 18° Celsius (minus 0.4° Fahrenheit). The vault is almost invisible from the outside; only a portion of the access gate is noticeable, surrounded by snow and ice. The location in Svalbard was chosen for its geological stability, accessible site, and reduced humidity levels. Also, the fact that it is situated well above sea level played a part in the decision. When they chose the site, officials simply did not anticipate the permafrost melting right into the entrance. According to Fowler, the good news is that the seed vault’s capacity to withstand natural or man-made disasters has not suffered. In 2015, he said in an interview that few things could really destroy the vault. Dropping an atomic bomb on top of the mountain would be one of those. Fortunately, he repeated those convictions on Friday. Even if all the ice in the world melted and the world’s largest recorded tsunami occurred right in front of the seed vault, it would still be safe. Calculations showed the vault is somewhere between a five and seven story building above that terrifying point. Even though the tunnel would flood, the seeds would still stay dry.